My Saint Patrick's Day tradition of the Guinness stew continues this year as I just put the big ol' vat of the stew in the fridge, awaiting tomorrow's reheating. For dessert, this year I am going with the Chocolate Guinness Cake, a recipe directly from Guinness Proposition 317 campaign kit. But instead of using the chocolate granache that came with this recipe, I frost the cake with the Bailey's Dip/Frosting I made last year. 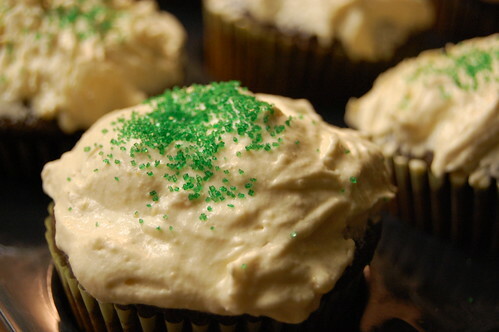 Not only you will have yummy Guinness treat, the color of the chocolate and the cream frosting does look like a pine of Guinness, the black and the creamy foam on top! I made a regular cake version of this for Paul's birthday yesterday. The cake was a little dry, but the frosting saved the day. Today, I made the cupcake version of it with the whole bottle of Guinness instead of one cup in attempt to add more moisture--it's only a splash more beer than a cup anyway--and it worked okay. Chocolate and Guiness = two of my favorite things.